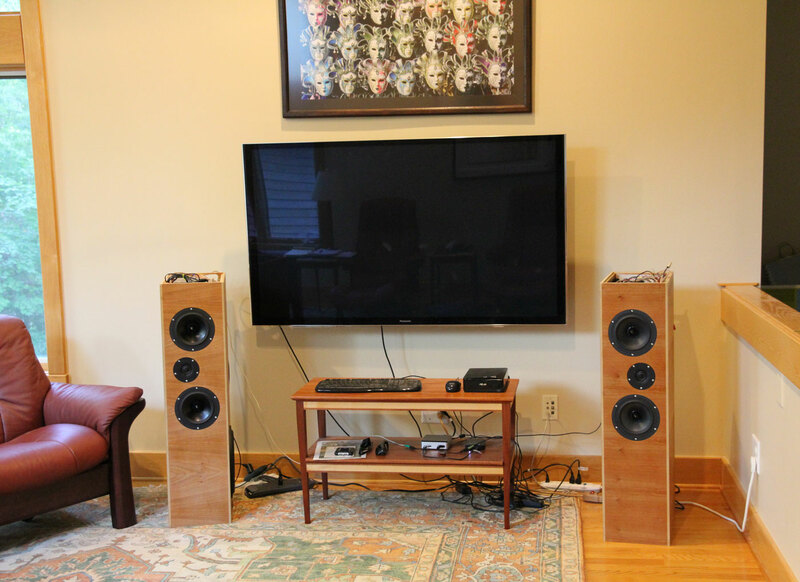 These speakers have 4 drivers. A tweeter, two midranges, and a woofer. The midranges are pretty deep and the woofer is more of a subwoofer in this usage. The woofer points sideways. 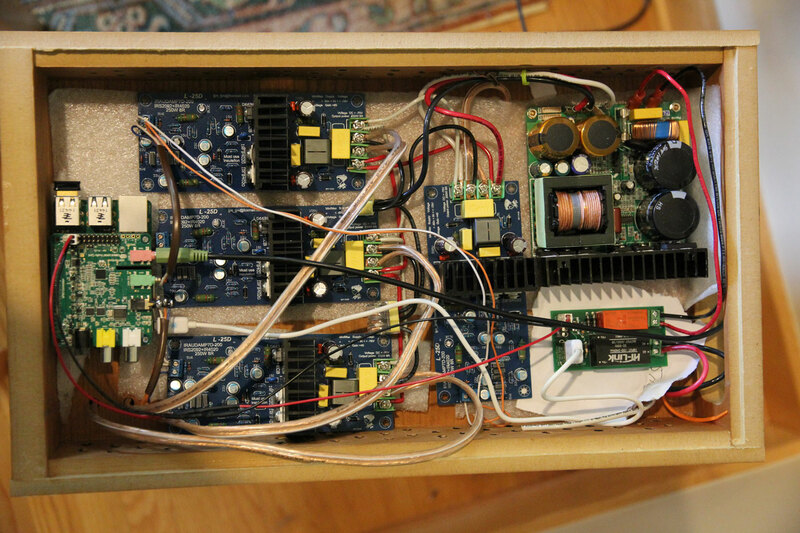 A Raspberry pi2 drives 4 Class D 200Wpc amplifiers. Each amp powers one speaker-driver. Here are the only two of the speakers. I may make more but for now I'm testing out the concept. These were made with cherry veneered 3/4" MDF that i had lying around. There's moderate internal bracing and they have some (not enough) polyfill inside. I finished them with shellac and poly. Here's a view of the top. Power comes in at the bottom of the speaker in an IEC jack (with a power switch). It comes up the inside of the enclosure and then to the very top (on the right) into a board i built that has permanent-on +5V to drive the Pi as well as a latching relay to drive the 110VAC. A latching relay uses no power except when changing state so i can drive the whole thing with a smallish power supply. The Pi drives the two relay latch lines. From the board it sends 5V to the Pi for power and it sends 110AC to the +-50V power supply. That drives all 4 amplifiers. If i really ran all 4 at 200WPC (which would absolutely destroy the tweeter and probably the mids) the power supply would run out of juice after a minute or so. In fact i just get big amps for the headroom (dynamic range). I use a custom kernel for the audio card and some LADSPA filters designed for crossovers to split the two channels and room-equalize the drivers. I then use the audio card built-in filtering and mixers to split the low end signal into 3 channels for the 3 low end drivers. This supports high quality (24/94 but i use 24/48) analog input as well as wifi/bluetooth and whatever else you can use with linux (wifi direct, ble, ...).